I think ultimately I’ll want to keep an open source (LAMP) platform because I want to own the data in my lifestream, have backups of it, and be able to move it around as I please. This leaves me choosing between a platform linked to a blog (WordPress or MovableType) or a standalone one (Sweetcron, Storytlr or similar) that just powers the lifestream. 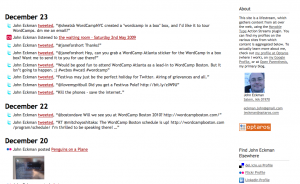 Originally I created JohnEckman.com as a standalone lifestream, thinking that the various blogs I wrote for around the web could be aggregated there – but there’s no reason why that couldn’t be a WordPress install as well. Anyway, what follows are my notes / first impressions – not an exhaustive evaluation certainly but a good shortlist to start with if you’re thinking of running a lifestream. 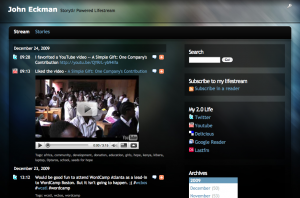 WordPress with the Lifestream plugin by David Kramer from Enthropia Labs. You can see this one in action on Open Parenthesis. The Lifestream plugin can group items by day to avoid clutter (days when I work from home and listen to lots of tracks on Last.fm, or upload 30 photos to flickr, that single source can easily overwhelm a lifestream) – though that isn’t available for all feed types. The plugin is also themable and extendable, which is key – you can add feed types, custom icons, or change display options at will. Movable Type Open Source edition with the ActionStreams plugin. I was very excited when the Action Streams plugin came out, and set up JohnEckman.com on MT just to be able to run it. Heck, I even wrote a few plugins for Action Stream parsing. However, I’ve been really lax about staying up to date with new releases. 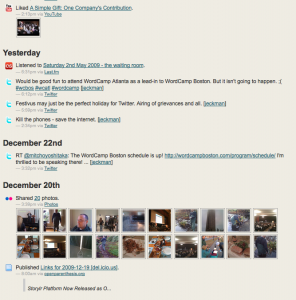 Having a number of blogs already on WordPress makes it far more likely I will keep that updated. 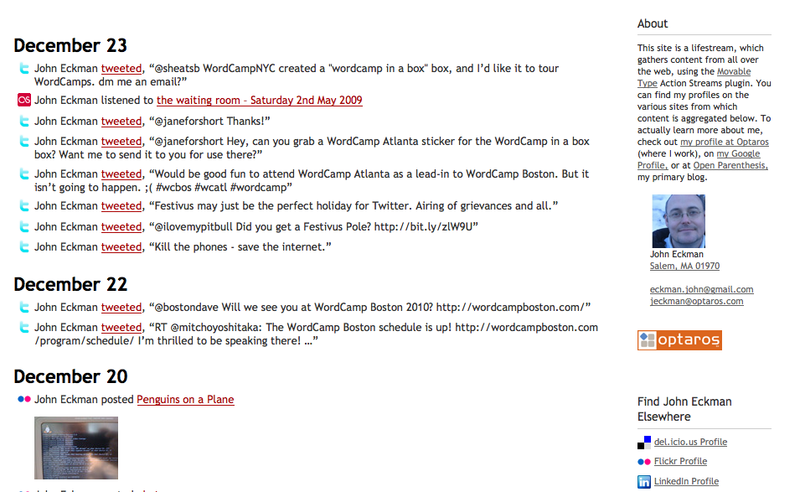 I know many folks use and love Movable Type but its mental model of how a blog works is just not in synch with mine the way WordPress is. That said, if you’re used to Movable Type’s approach, using the Action Streams plugin certainly provides a flexible, pluggable, themable way to aggregate your lifestream. Sweetcron an open source application built using the Code Igniter framework – see this one in action at nastyhack.org/sweetcron/. Unfortunately, the original developer has since moved on to other things and no replacement has clearly emerged yet. I like that it operates as a kind of standalone platform, not tied to a blogging engine, and gives you good theming potential – but I worry about the long term prospects for the project without a clear leader organizing and directing contributors. On the plus side, there are many great themes for Sweetcron, and if you’re familiar with code igniter as a framework . Storytlr – what was once a SaaS option but has ceased operations and released their code as an open source project – you can see my lifestream at nastyhack.org/storytlr/. There will be some work to do make the project more amenable to self-hosting (it was built to operate as a service), but it has the benefit of starting from a solid working foundation, not starting from scratch. They’ve also got a multiuser version, something which was often requested for Sweetcron but wasn’t forthcoming. (Will the WordPress Lifestream plugin work on WordPress Multi-user, which is being merged into the core code in 3.0? Don’t know yet). Chi.mp My Account) – Hosted service which serves as an OpenID provider as well as aggregating your lifestream. 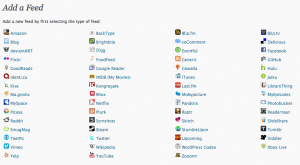 Integrates with Twitter, Facebook, Flickr, any RSS feed. Also enables you to import contacts from online address books. Seems to have gotten stuck on some old photos in its Flickr import and is failing to import newer content? (Haven’t spent much time troubleshooting here – mostly using it as a backup OpenID for when my primary one fails). Their focus has always been on enabling you to own your own data – allowing you to export all of your contacts and updates out of the site as a zip, which they still do, with appropriately microformatted content throughout. If I were to rely on a hosted version, this would be my top pick. Flavors.me (My Account – but check their user directory for better examples) – Hosted service, supports (as of 12/24) flickr, tumblr, twitter, vimeo, last.fm, facebook, goodreads, netflix, and generic RSS. Gets bonus points for using OAuth appropriately and not requesting usernames/passwords where they aren’t necessary. Offers some basic layouts and admin-side design flexibility (fonts, colors, backgrounds, and the like. (See this great review on the Lifestream blog for more info). 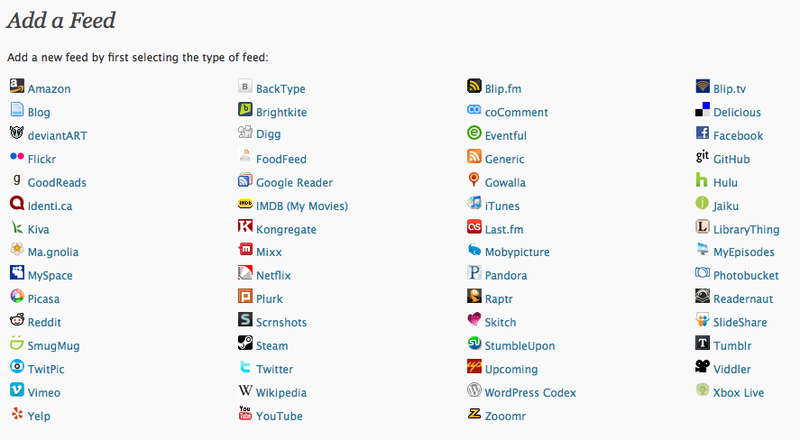 FriendFeed (My Account) – Arguably the giant in this space until getting acquired by Facebook. Probably keep this around as long as it exists, and do sometimes follow folks here, but not somewhere I’m spending much time anymore. Plaxo Pulse (My Account). Plaxo seems to be where my less internet-savvy family and friends get updates. Folks who aren’t on Facebook, or Twitter, or spending lots of time reading blogs and other RSS feeds, but get a periodic “pulse” from Plaxo of what’s going on in their network. For that reason alone I’ll probably never take it down. They’ve also got Joseph Smarr and John McCrea, who’ve been pushing for the open social web, open standards, and data portability. (Updated: Smarr’s moving to Google). They’re supporting OpenID, OAuth, Portable Contacts, and other new standards as soon as they are introduced, and I like that they’re good web citizens (and have continued to be, post acquisition by Comcast). That said, it still feels to me like a downstream destination for a specific kind of consumer, not the central place I’d think of as my lifestream. Ones I haven’t set up or tried to use: Lifestream.fm, AIM Lifestream. What are you using? What have I missed out on altogether? Heard about your article from lifestreamblog.com. Kudos for going out an trying out so many different lifestreaming tools. 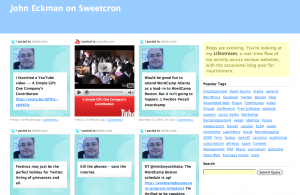 I’m a long time Friendfeed and Sweetcron user. You can check out my Sweetcron install on my site mitchmckenna.com. I’m a big fan of codeigniter, so Sweetcron is perfect for me. 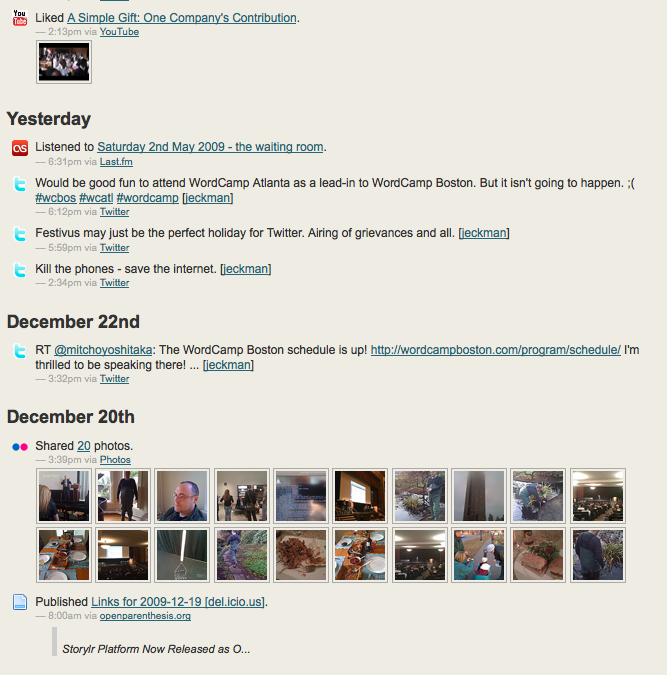 I’m growing tired of the boxy theme however and hope to create one that looks a little more like you storytlr screenshot. I’ve been making lots of little tweaks to my sweetcron over the last two years and hope to eventually contribute to a fork of Sweetcron.